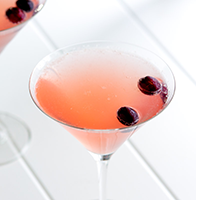 Combine Vodka, Grand Marnier, Cranberry Juice, Lime Juice and Ice in a cocktail Shaker. Shake. Pour into a Martini Glass then pour Champagne into glass and serve.